How do men and women’s roles and views of land differ? A recent landowner survey conducted by the Universities of Massachusetts, Maine, Cornell, and Vermont suggests that women play a unique and critical role in decisions about the land. Preliminary findings from the survey suggest that women feel less confident than men in their understanding of how to move forward making decisions about the land. Importantly, the study also suggests that when women are confident in how to move forward, they are more likely to choose conservation than men. So how do we help women become more confident with making decisions about their land? 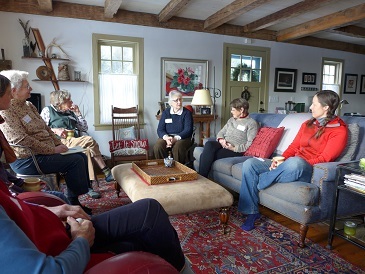 Two “Woodland Connections for Women” gatherings were recently held. One was organized by the East Quabbin Land Trust and Mount Grace Land Conservation Trust. The second was organized by the Franklin Land Trust. Both were funded through UMass from MA DCR’s Working Forest Initiative. The gatherings were an opportunity for women to get together to share stories, ask their questions, and enjoy each other’s company. The goal of these gatherings was to provide women the opportunity to learn from each other and gain the information and resources necessary to feel confident and move forward with future plans for the land. Increased the value of the program for 58% of the women. There is great interest in holding more “Woodland Connections for Women” gatherings. Women suggested focusing future gatherings on specific topics such as estate planning, wildlife, and invasive plant control. If you are interested in attending a future gathering or helping to organize or host one, contact Wendy Sweetser Ferris from Franklin Land Trust if you live in western Massachusetts. If you live in central Massachusetts, contact Sarah Wells from Mount Grace or Cynthia Henshaw from East Quabbin Land Trust.